The ISC August stamp line has a little for everyone! 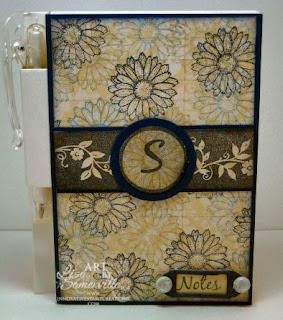 Delicate flowers, eclectic images, a kit packed with many artsy knick-knacks, beautiful card stock, buttons, & more! For a limited time only, save 10% on your ISC order, simply enter coupon code ls10 when you check out, but hurry, the code expires 8/20/09. I created this piece with items from the Little Bits N Pieces Kit, and the some of the Odd Findings images. The raised circle you see is a Ranger Memory Capsule, they work perfectly with the mini Ranger Frames. I stamped the key from Odd Findings plate in Black on my DSP, stamped the butterfly on a scrap and popped it up on a dimesional under the capsule. 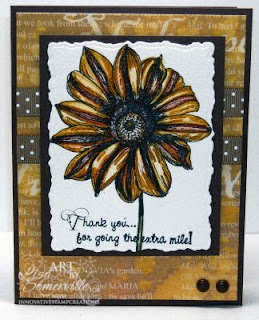 The beautiful flower is from the African Daisy plate, stamped in Black on watercolor paper and colored with Adirondack Markers using the Marker Watercoloring Technique. Again, I've added some of the DSP from the Little Bits N Pieces Kit, as well as the Brown Brads in the lower corner. I had these alterable notebooks in my stash of things - you can find them at Michaels. I liked the white one, because the backs are plain, so you don't need to cover both sides if you don't want to. Instead of stamping on card stock, I stamped on the Ledger Paper available in the Little Bits N Pieces Kit, stamping my images from the Make a Note plate, using the Depth of Field Technique. 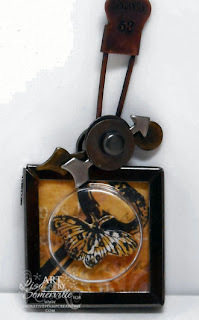 The trinket is to die for....amazing what you can do with paper, ink and bits & pieces.. These are all so wonderful, Lisa!! Love what you crated with all the little bits and pieces!! love them all Lisa - thanks again for all the inspiration .... and the wish list continues to grow ....! These are so pretty, Lisa! Love the little butterfly trinket and the layering on the daisy card.